with the dust you get from 100 packs you should be able to get something. because either you opened a lot of different cards, and so now have lots of potential decks. or, you opened a lot of copies of the same card so that you don't have a lot of different cards, but have a lot of dust. For me it was 52 packs + Hall of Fame dust. I had above 10000 dust. Sure you can craft something with the dust from twice as many packs. Your Standard BombWarrior Has Taken Over Tavern Brawl This Week! And that's why you put 2 weapons breaks in your bomb warrior deck. 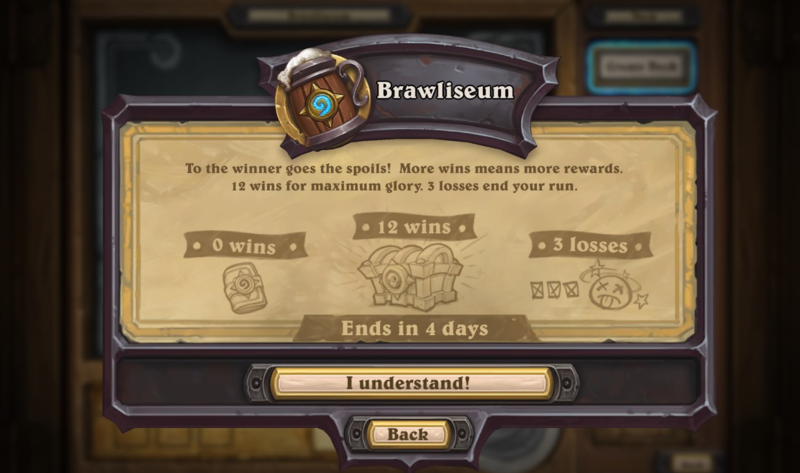 If I remember correctly they make first brawl brawliseum after every expansion release. Let's celebrate the 200th Brawl by making it literally Standard ranked (again). Good reward structure, but how more boring can you get? For Tavern Brawl #200 I was expecting something more, but... it's Blizzard, what do you want. Um what's better than getting free rewards for the #200 Brawl? This weeks Tavern Brawl is "You don't get a real Tavern Brawl!"